What can one say about March? From a gardener's perspective, it is full of promise yet fraught with disappointment. This March has been more challenging than the over sixty I have witnessed in my life. Three nor'easters brought snow, wind and debris to the garden. The tide is receding leaving in its wake a lawn full of sticks and branches. It looks as though Mother Nature herself had the Noro virus. The oaks, which usually hold their leaves until the spring push of buds have been long bare. This is, in part, due to last season's second invasion of gypsy moth caterpillars. There are not too many leaves on the ground as a result. Change is afoot in the garden. The little Crocus tommasinianus Roseus have popped up in the lawn. The snowdrops continue to bloom as do the Eranthis/winter aconites which shrug off their wrap of snow with no ill effects. The hellebore foliage has taken quite a beating this winter and the ever sturdy and faithful Helleborus foetidus, usually blooming on St. Patrick's Day, is black and bruised requiring a quick shear. Some areas of the garden, those north facing, are still covered with several inches of snow. It has been a cold month and while the sun and the earth are warm after a mild February, snow melt is slow. In some respects this is a boon to a gardener who has to rake and clear. Cleanup of the bare, south facing gardens allows a bit of recuperation time for winter lazy muscles. It has been below freezing almost every morning in March to date but in spite of the cold temperatures leaves emerge in response to longer day length and warming sunshine among other things. The real activity in the garden is taking place sight unseen below the soil as roots begin to awaken and absorb life giving moisture and nutrients. I will not be sad to say goodby to the weather of March this year. The tiny burgeoning beauty of buds and early flowers would be overlooked if they happened at the same time the opulent peonies bloomed. Each daily garden walk exposes a new bud, flower or bird song. March does reveal, in tiny doses, the march of the season. I just have to remind myself, each cold or miserable day, to look for what is right there in the March garden. The tiny things. The little bulbs, Scilla siberica, Crocus, and Eranthis hyemalis have been up for a while but they fail to unfurl when the temperatures are cold. (I did sneak in the snowdrops). It is generally around 50F when the flowers open. We have had very few days with temperatures over 50F. Yesterday was the perfect spring day for working in the garden. You might disagree. I like it cool when pushing a wheelbarrow of compost and dragging leaves raked from the gardens. I noticed the flowers wide open while cleaning beds. It is very hard to stop raking and dragging and compost spreading to pick up the camera. It breaks the rhythm. I did force myself, i.e. needed to stop in order to rest the weary muscles, to run in and get the camera. The ground is fairly dry which is a good thing since photographing small flowers requires the prone position. Bright yellow is harsh this time of year and I must remember to put the Eranthis next to the scilla. A mixed bed would just be glorious. 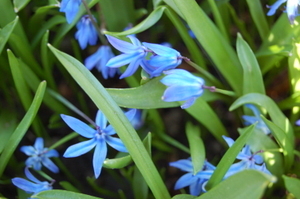 There is nothing so blue as this little scilla. Even the pollen is blue. One lone purple striped crocus is blooming in a corner of the garden. It is difficult to notice just one crocus especially one that is white and purple. It called to me begging to be noticed. It deserves better placement and more added. The small bulbs are a good way to start the spring season. They would get little attention if they bloomed at the same time as that showgirl, the herbaceous peony. What is your favorite small bulb. I cannot choose. I just can't. Thanks to Cindy of My Corner of Katy for her inspirational 'Three for Thursday'. Another beautiful but very warm day. It is hard enough on the plants but we humans are not quite acclimated to this temperature change either! After record rain the weekend previous to this one, I am now hearing that fire danger is high! Well, enough of that and on to more interesting items. The blues are out! This is the first spring that I can remember that the Glory of the Snow, Chionodoxa forbesii, have not bloomed on Patriot's Day! Here is a picture of these little beauties! It is a true blue which should be planted en masse in the fall when the bulbs are available. Lovely , don't you think? 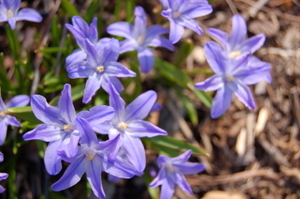 One of my favorite blue flowers in the spring is the Siberian squill, Scilla siberica. It is a bulb and should be planted in the fall in large groups which will give a good show. I have this under a crabapple tree with Blue plumbago planted in the same bed. The blue plumbago, Ceratostigma plumbaginoides, is a great companion plant as it does not emerge until the scilla are done blooming. One interesting note on this scilla is that it does readily reseed. I have a path of it across the lawn to the woodland border just where I rake the bed out. It is sparse but discernible. The blue plumbago blooms in late August and is also a good, true blue. The only blues necessary in the spring are a few of these lovely bulbs!